The Trust serves one of the most diverse communities in the country. We provide services for many races and cultures, and go to great lengths to engage with communities from all backgrounds. Most importantly, we are committed to delivering safe, effective care to our patients in an environment that recognises and promotes the principles of equality, diversity, and non-discrimination. This means that there must be a mutual respect and tolerance for each other’s beliefs and backgrounds, regardless of race, gender, sexuality, religious beliefs, or age. We are enthusiastic about engaging with our community. Below you can see some of the events we have held to raise awareness around health issues that affect our population, but also some joint community initiatives that are helping to enhance patient care. 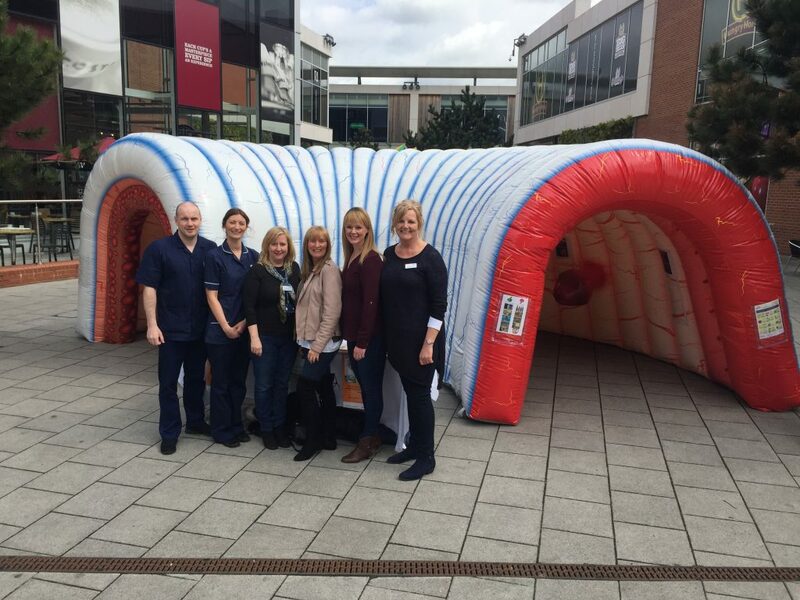 The Bowel Cancer Screening team with the inflatable walk-through bowel. A giant inflatable bowel which takes you on a journey inside the organ has been touring Sandwell and West Birmingham to raise awareness about a vital test which can save lives. The Bowel Cancer Screening Programme (BCSP) team from Sandwell and West Birmingham NHS Trust have taken the inflatable to various events, and it has even stopped shoppers in their tracks on West Bromwich High Street. Patient Janet Hopkins, 69, of Great Barr, backed calls for people to use the home kit that is sent out every three years to people between the age of 60 and 74. The grandmum-of-four, said using the kit saved her life after she was diagnosed with cancer. “I was sent the kit previously and didn’t use it, then three years later another one came through the post. “At the time I was experiencing blood in my stools. I thought it was piles and put off using the kit, but my husband encouraged me to do it. “In the end I did the test and sent it back to the hospital. Two days later I had a call to say I needed further testing, and it was discovered I had cancer. But they treated it in time and I am now cancer free. Maggie Preston, BSCP lead at the Trust, said: “We have the inflatable bowel to encourage more people to use the home test that is sent to them. 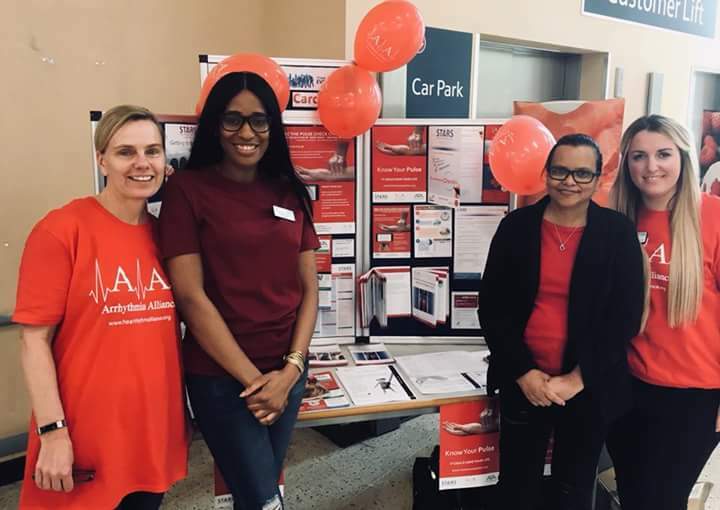 Stephanie Coates, Matron for Cardiology, and Laura Taylor, Professional Development Sister, were raising awareness around heart health at Tesco Springhill, in Birmingham. They demonstrated to shoppers how they can take their own pulse. Laura Taylor, Professional Development Nurse, said: “World Heart Rhythm Week is focused on fainting or what is otherwise known as syncope – it’s about saving lives. There is no such thing as a simple faint. The event was part of the Arrhythmia Alliance World Heart Rhythm Week. Arrhythmias (irregular heart rhythm disorders) affect over two million people in the UK but by being heart rhythm aware, arrhythmias can be identified early. Alcohol abuse in Sandwell and Birmingham costs the NHS a staggering £72.1 million a year. And around 300 patients are being seen every month at Sandwell and West Birmingham Hospitals NHS Trust (SWBH) suffering from some form of alcohol abuse. 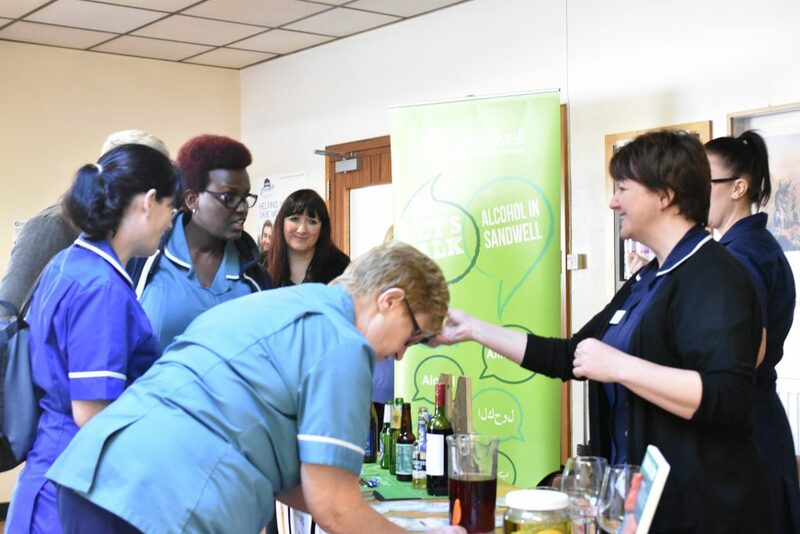 Arlene Copland, Lead Alcohol Specialist Nurse from SWBH, said during Alcohol Awareness Week: “We see a startling number of patients coming into our emergency departments who need help to control their alcohol intake. “But what they don’t realise is drinking too much can lead to a number of serious health problems, such as liver disease, cancer, fertility issue, stomach ulcers, raised blood pressure, stroke and dementia. “It’s important that everyone knows what their limits are. National guidelines recommend that both males and females do not drink more than 14 units per week. The theme for this year’s Alcohol Awareness Week centred around encouraging people to think about how drinking can also affect their family. SWBH worked with Swanswell and CGL to organise a number of activities at Sandwell and City Hospitals to raise awareness among patients, visitors and staff. Arlene added: “We organised drinks tasting where people can try non-alcoholic cider and wine. There was also a short quiz and visitors were able to try on special beer goggles which give the same visual effect as when a person is drunk. Kam Dhami, director of governance, talks about Purple Points with patient Peter Broome, from West Bromwich. A hospital hotline has been introduced at Sandwell and West Birmingham NHS Trust to respond to concerns inpatients or their loved ones may have about care. New Purple Points have been installed outside ward areas at Sandwell, City and Rowley Regis Hospitals, which have phones that link directly to a team of advisors. The aim is to address concerns quickly, before the patient is discharged. The phones can also be used to compliment staff for the care they’ve given. 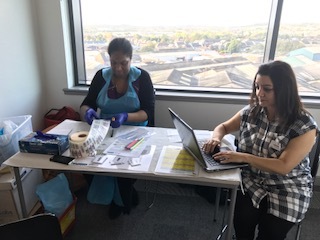 Clinicians from the Trust have been working with Sandwell and West Birmingham Clinical Commissioning Group (SWB CCG) in screening more than 200 patients for blood borne viruses and latent tuberculosis. At a recent event for ESOL (English for speakers of other languages) students, held at Sandwell College, in West Bromwich, 228 students were tested. It’s been hailed a success by Natasha Ratnaraja, Consultant in Infection, and SWB CCG. Pav Jheeta and Cassie Craig from microbiology ensuring the samples obtained at Sandwell College are entered into the computer and all identified correctly. Natasha said: “In one day of screening we have tested a total of 228 students for blood borne viruses (BBV), including 194 for latent tuberculosis infection (LTBI). Of those tested for LTBI, 23 were positive. For those tested for BBV, there was a positivity rate of 10.96 per cent for hepatitis C.
Patients who have the test must be aged between 16 and 35 and must have arrived in the UK from a number of countries in Asia and Africa, but also Vietnam and Peru, within the last five years. These countries are known to have a high incidence of TB. Tests done at the screening event go back to our laboratory and those with a positive TB result are sent to the TB nurses, who then contact the patient offering them an X-Ray and treatment. Positive blood borne virus results will be sent to the GP, asking them to refer to Dr Singhal or the QE in the case of hepatitis B and C, and Dr Sivaram’s team at Dartmouth Clinic in the case of HIV. Patients can then receive the appropriate follow up and care. Negative results are passed back to the patient’s GP. It’s the fourth time the team has been out into the community to carry out a screening session. In September, they went along to the Bangladeshi Islamic Centre, in Smethwick, previously they have visited the Church of the Nazreen in Handsworth and the Nishkam Centre on Soho Road.